If the nation as a whole during the 1940s was halfway between the Great Depression of the 1930s and the postwar prosperity of the 1950s, the South found itself struggling through an additional transition, one bound up in an often violent reworking of its own sense of history and regional identity. Examining the changing nature of racial politics in the 1940s, McKay Jenkins measures its impact on white Southern literature, history, and culture. 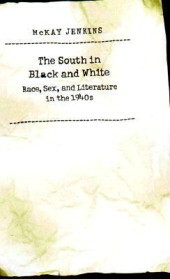 Jenkins focuses on four white Southern writers–W. J. Cash, William Alexander Percy, Lillian Smith, and Carson McCullers–to show how they constructed images of race and race relations within works that professed to have little, if anything, to do with race. Sexual isolation further complicated these authors’ struggles with issues of identity and repression, he argues, allowing them to occupy a space between the privilege of whiteness and the alienation of blackness. Although their views on race varied tremendously, these Southern writers’ uneasy relationship with their own dominant racial group belies the idea that “whiteness” was an unchallenged, monolithic racial identity in the region.